Fall into maximum comfort on the Manhattan Design District plush pillow top queen mattress. Three different layers of high-density foam surround a layer of pure super soft latex for the ultimate in body contour support. Includes power packed 15-gauge wrapped steel coils for reinforced structural support where you need it most. 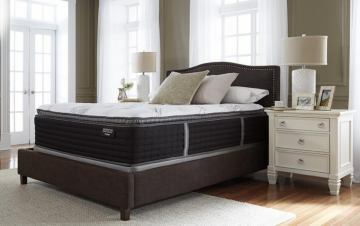 Plus, 2 perimeter rows of 13-gauge wrapped coils offer edge support for a larger sleep surface and better overall support. Foundation/box spring available, sold separately.